Get ready for the 2008 Olympiad! Olympiad tournaments are quite interesting. Of course traveling to foreign countries can be fulfilling, but the Olympiad tournament has a mystique like no other tournament. Being able to see flags hoisted during the opening ceremonies is an interesting spectacle along with the renewing of friendships and the development of others. What is so special about the Olympiad tournament and how does it differ from other major chess events? Is it the staccato of different languages being spoken? Is it the unique non-verbal expressions of communication? Is it the patriotic, colorful garments worn by the players? Is it the flags festooned throughout the tournament hall? Perhaps it is a combination of them all. Who can forget Zambian women’s player Linda Nangwale? Her hair featured the colors of the Zambian flag and received praise from many famous players. These memories leave a lasting impression and unlike other international tournaments, nations barely appearing on the chess landscape are able to experience this spectacle and add their own flavor to the venue. Opening Ceremonies of 2006 Chess Olympiad (Turin, Italy). 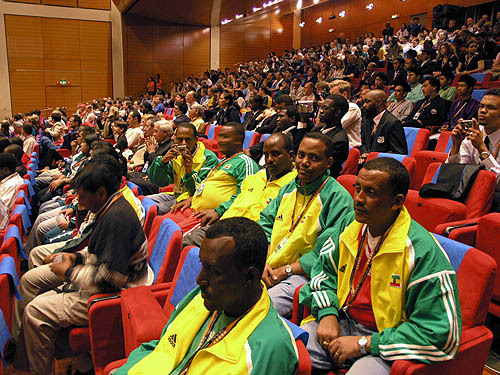 The Olympiad is a special tournament and most of the stars are able to show their national pride as opposed to their own individual status in a given tournament. It is also very interesting to see players close up and to converse with them in a relaxed environment where the elite players are conjoined with the rank and file. There is a certain spirit present in the hall and there are always stories one can take home. If you have not been to an Olympiad tournament, then put this on the list of things to do! Take a look back at Drum coverage from 2002, 2004, 2006… enjoy!! Maurice Ashley told me he’d like to attend an Olympiad. There has not been one in America yet. Ironically, Cuba in 1966 was the closest when Bobby Fischer got 15/17 for the USA. The USCF is in such bad shape that it would be hard to imagine them pulling it off. I’ve seen a photo of Bobby playing a young Fidel Castro at Google images. We probably need to move to another thread, but I have seen those pictures from the famous 1966 Olympiad. Actually he was kibitzing in one of Castro’s games. This is one of the interesting pictures of Bobby Fischer shaking with Fidel Castro. 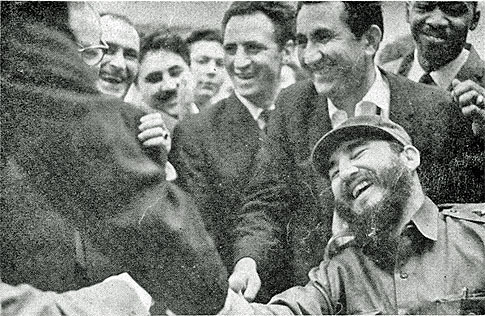 World Champion Petrosian stands over Castro’s right shoulder. There is a person behind Petrosian, but I don’t know if that is Rogelio Ortega or not. Ortega was the Cuban champion at the time this picture was taken… and was Afro-Cuban. 🙂 That is the same Olympiad where Mikhail Tal was mugged and sent to the hospital… and Fischer visited him! Fidel Castro shaking hands with Bobby Fischer at the 1966 Chess Olympiad in Havana. Tigran Petrosian is behind Castro and was World Champion at the time. An unidentified person of African descent is behind Petrosian. Is that Rogelio Ortega, the 1966 Cuban champion? ?